VANCOUVER — Ty Smith has had to make some adjustments at the 2019 IIHF World Junior Championship, starting with his ice-time. An all-situations minute-muncher as the Spokane Chiefs’ top defenceman and co-captain — not to mention the first overall pick from the 2015 WHL bantam draft — he’s used to having free rein. Now, suddenly, Smith has to carry a stop-watch when he steps on the ice for Team Canada. Not literally, but mentally. He got a reminder of that following Canada’s tournament-opening 14-0 trouncing of Denmark on Boxing Day when Smith led the team in total ice-time despite being listed as a bottom-pairing defenceman on the depth chart. Turns out, that’s because he was still averaging more than a minute per shift. “I was a little bit long in the first game and they told me I needed to bring that down a little bit,” Smith recalled of his conversation with head coach Tim Hunter and assistant Brent Kisio, both of whom are bench bosses in the WHL. That message got out to the media and became public, but Smith responded like a pro — getting his average shift length down to 37 seconds in Canada’s next game, a tense 3-2 win over Switzerland on Thursday. He settled in between the two extremes for Canada’s third contest, following up with a player-of-the-game performance in a 5-1 victory over the Czech Republic on Saturday that saw Smith tally two assists on power-play goals. Brett Leason redirected Smith’s point shot for the go-ahead goal that stood up as the winner. Evidently, Smith was making the most of his minutes in earning that team-selected award. It had to be a neat moment, hearing his name announced to receive the honour in front of more than 17,000 fans at Rogers Arena including his parents Wayne and Lorianne. “Pretty cool, for sure, and being 3-0 is good too — that’s the main thing,” said Smith, who is up to three points (all assists) and a plus-4 rating through three games ahead of facing Russia in today’s first-place showdown to finish off the round-robin portion (5 p.m. PT, TSN). The top seed in Group A will be at stake in that battle of unbeaten teams, which promises to be another epic New Year’s Eve clash. As that quote suggests, Smith and his Canadian teammates are still locked in the zone — still focused on the ultimate goal of winning gold and repeating as champions. The medal round begins Wednesday with the quarterfinals, followed by the semifinals on Friday and the championship game on Saturday, Jan. 5. Canada won’t want to slip up against Russia or experience a letdown — their level dropped, at least slightly, from Denmark to Switzerland before returning to form against the Czech Republic — but there will be no room for error the rest of the way after today. “The biggest thing with us is just knowing you have to be ready any time you get on the ice, and everybody has been doing a pretty good job at that so far,” Smith said. Smith isn’t wearing a letter on his jersey here — he did captain Canada at the under-18 worlds last April in Russia, losing out in the quarterfinals there — but he’s doing his best to lead by example. As he does in Spokane under coach Dan Lambert, who also played for Canada at the World Juniors back in 1989 when the tournament was strictly a round-robin format and Canada finished fourth in Anchorage, Alaska. The similarities between the two as players — Lambert was also an offensive-minded defenceman in his day — has helped them develop a close bond over the past two seasons together. 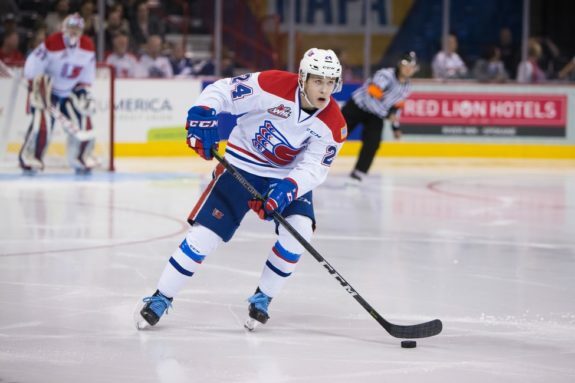 Lambert likes to let his horses run, with Smith and Team Canada forward Jaret Anderson-Dolan, the other co-captain in Spokane, leading the charge for the Chiefs. Lambert also likes to have fun and keep it light — much like Hunter in Moose Jaw — and he’s not shy about reminding Smith of his exploits as a player. “When he was 18 in the Western league, he had 100 points, so he kind of gets on me a little bit about that and makes fun of me a bit,” said Smith, who was leading all WHL defencemen in scoring when he left for the World Juniors with 39 points in 28 games — prorated to 95 points over a full 68-game season. A quick fact-check showed Lambert actually racked up 102 points in captaining the Swift Current Broncos to the 1989 Memorial Cup championship, winning MVP honours in the process. That will be a tough act to follow — a tough feat to top for Smith. Thus the ribbing, but Smith may soon be able to return fire with superior World Junior stats. Lambert finished with three points (one goal, two assists), so Smith’s next point will give him the upper hand there and a medal of any colour — gold, silver or bronze — would make for more bragging rights. Not that Smith plans to rub that in when he gets back to Spokane — should it come to fruition. 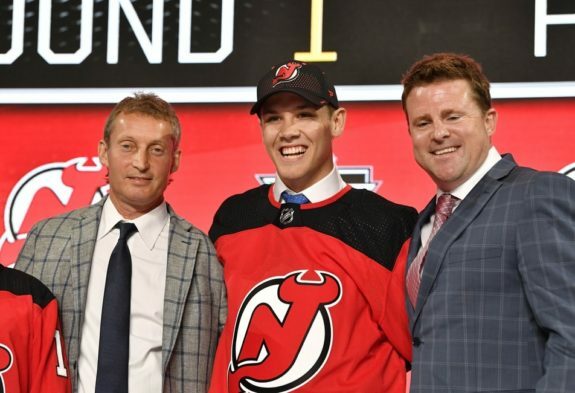 “We have a really good relationship and I’m really thankful that he’s my coach,” said Smith, who finished second in WHL defence scoring with 73 points last season, which was good enough to get drafted 17th overall in the first round by the New Jersey Devils this past June. Ty Smith poses with team representatives after being selected by the New Jersey Devils in the first round of the 2018 NHL draft in Dallas. Truth be told, there wasn’t much time for reminiscing on this day — with TSN also waiting to interview Smith as player of the game (and the team magician) — but Smith did share some tidbits of interest. For one, he no longer calls Lloydminster home — nor do his parents, with Wayne now owning a sign company in Saskatoon and Lorianne a teacher in Prince Albert, Sask. Ty, who played his bantam-draft year in Delta, B.C., now spends his offseasons in Vancouver training under, among other people, Brendan Gallagher’s dad, Ian. That doesn’t mean Smith isn’t repping Lloydminster on the international stage — the place where he got his hockey start and returned to play major midget before moving on to Spokane, and where his father worked as an operations manager for an oil company called Weatherford. Whenever Smith makes it back to the Border City — as Lloydminster is known, for straddling the Alberta-Saskatchewan border — he skates with Eric Morrissette, who coached him in the prestigious Brick tournament in Edmonton when he was 10 years old and now runs the YOURHockey program. And Smith still sees a lot of his old teammates from Lloydminster on a regular basis, having turned into rivals spread across the Western Hockey League. From the major-midget team, there’s Zane Franklin in Kamloops, Bryce Kindopp in Everett, Jaxan Kaluski in Seattle, Chase Wouters in Saskatoon and Ryan Schoettler in Prince George. Going back to minor bantam, that list grows to include Kobe Mohr and Orrin Centazzo, both now in Kamloops with Franklin, plus Elijah Brown in Medicine Hat, who hailed from Cold Lake, Alta., but played a few games with that team. Smith also mentioned Dallas Hines in Kootenay, who is two years older than him, but they played together when Smith got called up an age group throughout minor hockey.